I wish to start my blog by introducing you to my latest watercolor painting, which I call, “House Jetty”. This painting was completed on 16 April 2013. But the story goes much further in time. I visited this place on 17 June 2010. 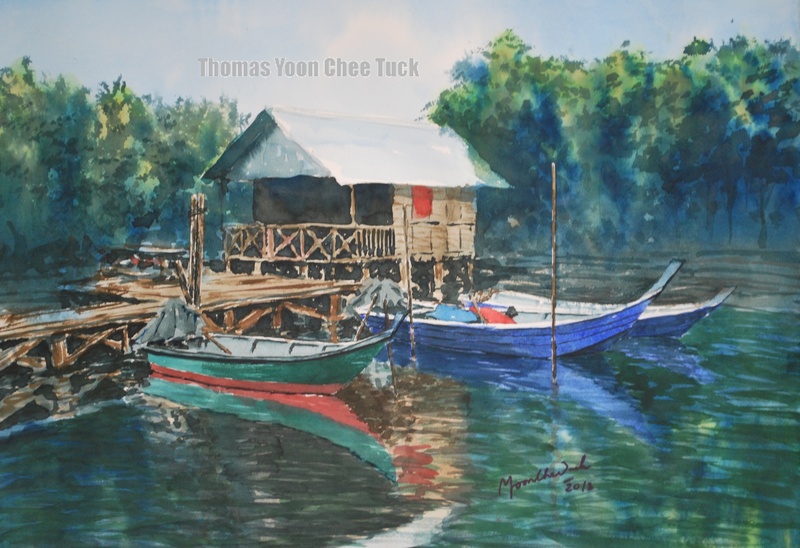 The scene was taken from Sungai Chandong Kechil, (in malay language, it is the Chandong Kechil River) Pulau Lumut, on the way to Port Kelang, Malaysia. What I find fascinating about this place was the silence and peace amidst the bustling traffic all around me. I had to stop my car along the roadside, and walk a bit down the slope of the river bank. The scene was not as perfect as what I had painted. There were trees that obscure the view, which I eliminated from my painting. Actually, the water was a bit muddy, but the artist in me strove to make it as beautiful as I wanted it to be. That’s the advantage of an artist over a photographer. The artist can remove or add in objects as he/she thinks fit in order to make a composition which is pleasing to the eye. But the camera is a great tool to use, especially with the advent of the digital camera, where plenty of images can be snapped without any worry about film wastage and then the spoilt images can be easily deleted at will. Curiously, I could not find anybody around. I was alone by myself. Perhaps, the fishermen had left for their morning break. The water was still, and there were hardly any ripples on the surface of the water. The river was near its mouth. Whatever water movement would be from the rising or falling tide of the sea. The surroundings were mangrove swamp, where plants tend to sprout out from any place, eventually surrounding the house, but bringing with them numerous wildlife.